Cars entering the intersection at Carmel Valley Road and Laureles Grade. Photo by PRISCILLA CABALLERO. Within Carmel Valley lies the familiar intersection at Carmel Valley Road and Laureles Grade, which sees dangerous traffic from all angles. 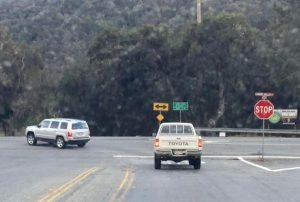 For as long as community members can remember, despite past collisions, drivers coming down the grade have been yielding to the same stop sign, waiting their turn to dodge the high-speed traffic coming from west and east down Carmel Valley Road. In the past two years, there were a total of five collisions near Laureles Grade along with one fatal collision. Although Carmel Valley only has an estimated population of 6,057, according to the Census Bureau, five collisions in the past two years is something to take into consideration, as these tragedies could have been avoided if a better traffic system were implemented. Now is the time for a change, such as a roundabout or traffic signal. If either one of these changes were taken into consideration, it would prevent reckless driving, save time, prevent car accidents and, most importantly, save lives. Studies from the California State Highway System for Roundabouts show that roundabouts are a safe option and reduce total collisions by 59 percent, meaning that it would be an optimal choice for Carmel Valley Road. “Roundabouts are proven to be more effective by reducing injury collisions by 60 percent to 87 percent, total collisions by 37 percent and fatal collisions by 90 percent,” the U.S Department of Transportation says. It is necessary to have safety come first before anything and protect the people of our community from obstacles with clear solutions. The three-way traffic that occurs now also makes it difficult for drivers to see over the hills. For example, coming from the west side of Carmel Valley Road, there is a sharp turn along with cars coming rapidly from Laureles Grade. The cars merge into the intersection, but often collisions occur because there isn’t a clear vision of the road in either day or night when coming from the east. Additionally, it becomes time consuming and the stop sign has not been a big help over the years, considering fatalities that have occurred in the past. One fatality in particular was a 26-year-old motorcyclist who died in 2014 after he crashed his motorcycle on Laureles Grade near Carmel Valley Road and collided with an oncoming Mini Cooper, according to the California Highway Patrol. Raul Martinez, assistant transportation engineer from the Carmel Valley Road Advisory, notes that the Carmel Valley Community Club is in the works of putting together requests for a proposal of a roundabout for the intersection. Apparently, the Carmel Valley Community Club and others are concerned the intersection is a danger, and the community is in the preliminary phases of the roundabout approval, which has been discussed since December. The committee will hopefully have enough money to proceed.